I can assure you that this is NOT the only nation that does and has done these things. Fared Odeh, 14, possesses a world of courage and conviction that he must fight the illegal occupation that stole his homeland, his life, his family’s life, and the lives of millions of Palestinians. 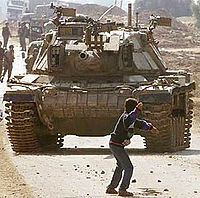 Tragically he was shot and killed by these cowardly soldiers who despite their tank feared a stone. – Chris Hedges, Pulitzer Prize Journalist, in; “A Gaza Diary: Scenes from a Palestinian Uprising,” Harper’s magazine (October 2001). Complete BS from Veteran Nazis Today.